I’ve seen several really helpful full bust adjustment (FBA) tutorials and while I don’t think I’m covering new territory, I do think there can’t be too many tutorials for this tricky adjustment. I mean, it’s not that tricky but doing your first FBA is tricky. It’s a slash and spread method of pattern adjusting. Rather than just add to the side seam for a larger bust, you’re creating space in the middle of the pattern while keeping the armhole and side seams intact. 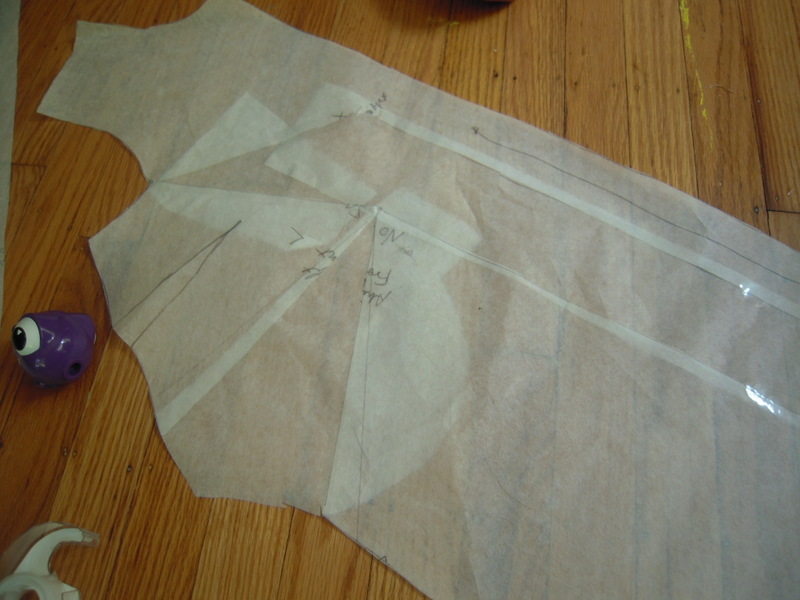 Dress pattern cut to my High Bust size out of Swedish Tracing Paper- it’s the bomb! 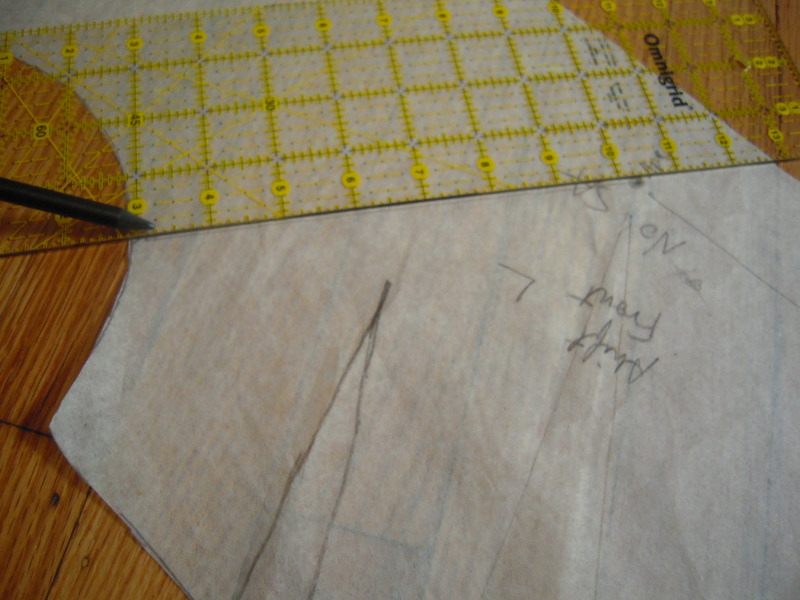 I started with tracing the size L of the Shift dress from Built by Wendy: Dresses book. 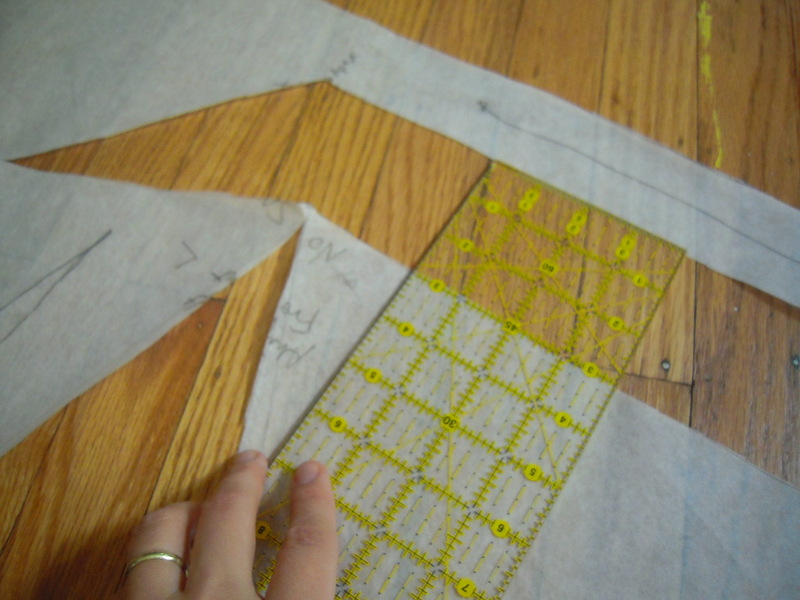 The L works for me because I usually use my high bust measurement to choose my pattern size. Of course, this means I perform an FBA, adjust for the waist and usually take it in at the hips. Before you start, do like I did and trace your pattern. This way, you can always go back to the original if you have a goof up. On several occasions, I’ve strayed so far from the original pattern I’ve scrapped the traced pattern and started with a fresh copy. 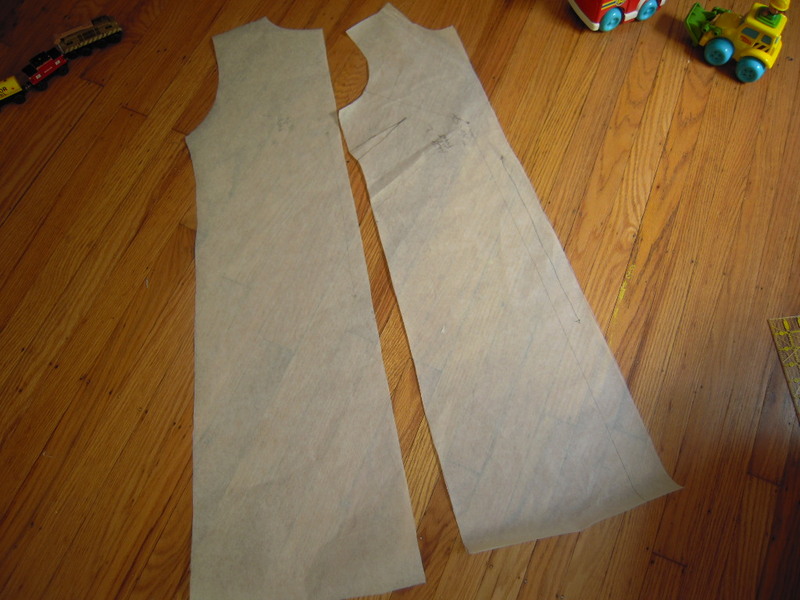 Pin the side seams and the shoulder seams so you can try on your pattern tissue. I’m only going to address the FBA, but you really do want to alter the back first. If the back fits already, you can go ahead with your FBA. With the tissue on, measure how far the center front is from your center front. Measure that amount. You’ll be using it in a mo’. Depending on the amount of stretch in the fabric I’m going to be using, my FBA adds between 2 and 3 inches, sometimes less for really stretchy fabric. I also take into account the amount of design ease and try to factor that in to how much of my FBA range I add. I don’t like really blousy tops or dresses so trying on the tissue is always a step I take. Below, you can see me drawing in the apex- the point which will determine where you point your cutting lines. Marking the Apex and drawing lines for the FBA. One to the armhole and straight down to them hem. One to the middle of the side dart. The next line is drawn from the apex to the center of the side dart. Whether there is a pre-existing side dart or not, doing an FBA creates a dart, or a larger dart if your pattern already had one. You can always pivot the dart to another part of the pattern piece. There is really no wrong answer when it comes to where you can move the dart. I’ll explore rotating darts another time. 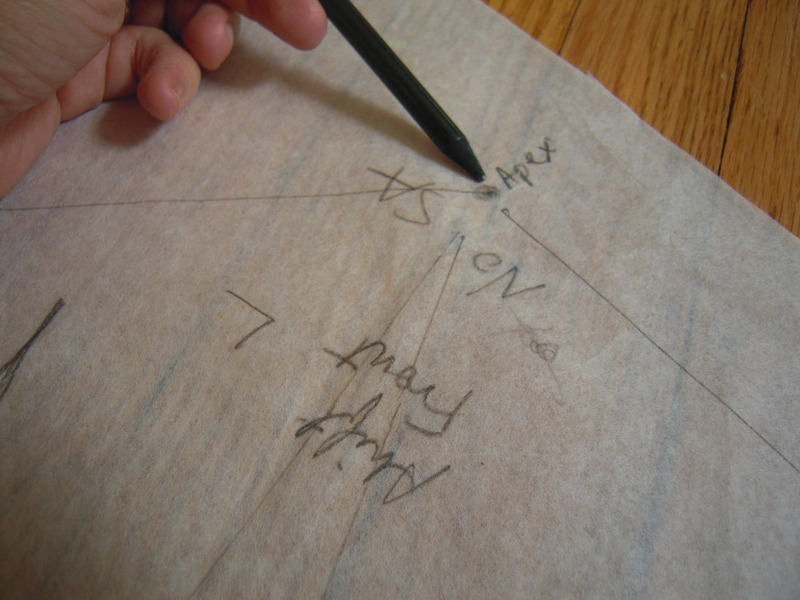 Draw a line from the apex you just drew, or the one provided on the pattern piece, to the armhole. You’re aiming for a point 1/3 of the way in from the side seam. Continue drawing the line from the apex straight down to the bottom hem. Drawing the line to the sleeve notch. Adding the line from the Apex to the middle of the bust dart. Cut your first line from the hem all the way to the apex and off to the armhole. See pic below. 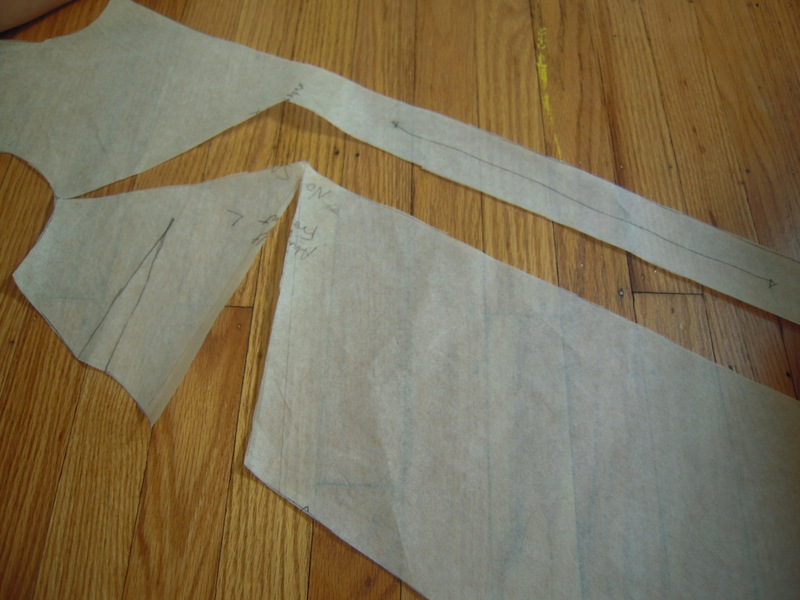 Then, cut the second line, the one from the side seam to the apex and cut in that direction. You won’t be cutting through the apex. You’re actually creating a hinge at the apex. Cut at the lines. This is the way you get room where you need it. The third line you’ll draw can be done anywhere below the apex, to the right of the 1st line you drew and cut. This will be the last line to be cut and the last one to be adjusted. You have now “slashed” your pattern. Time to “spread” it. Take the amount you measured from the original center of the pattern to your center and spread your pattern until you measure that amount. I added 3 inches to this pattern, so I spread it until I got a 3 inch gap. 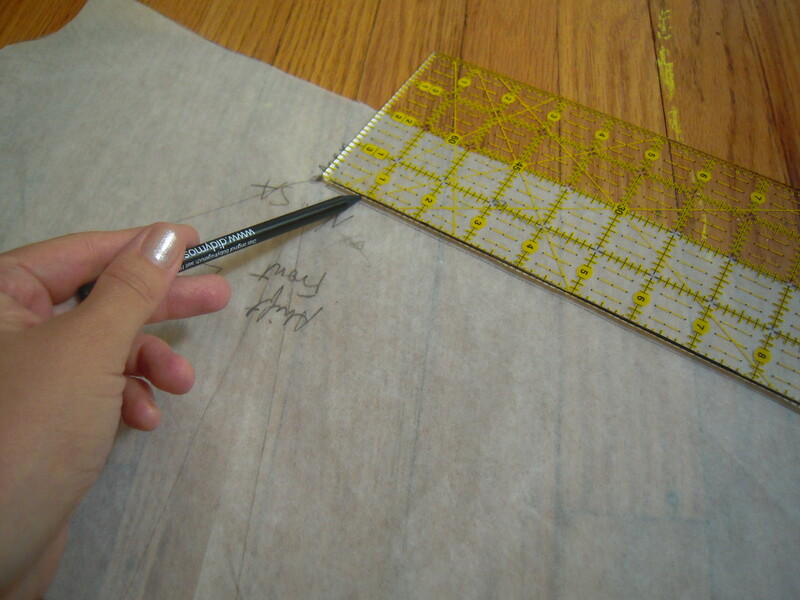 Spread out your pattern until you measure the amount you need to add. Since I did this FBA on my hardwood floor, I anchored the slashed pattern piece with tape on the floor. 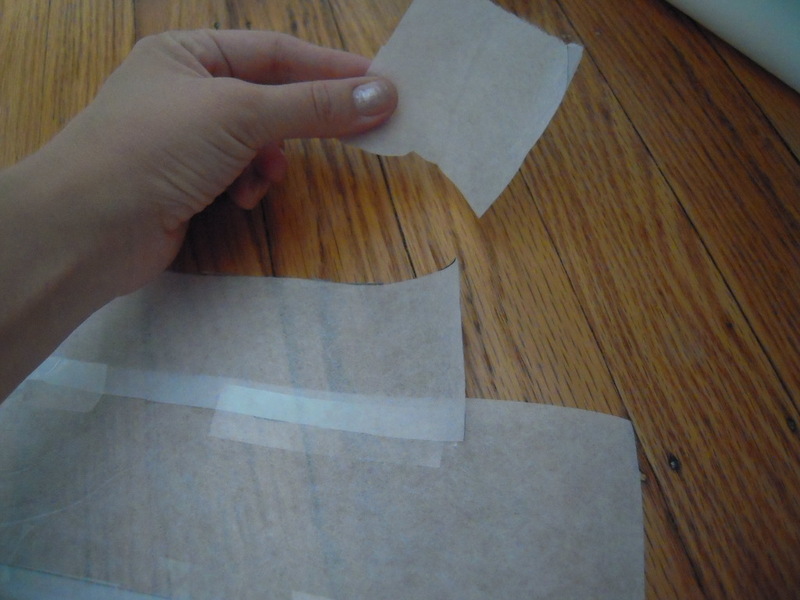 I then added tissue paper to fill in the gaps. 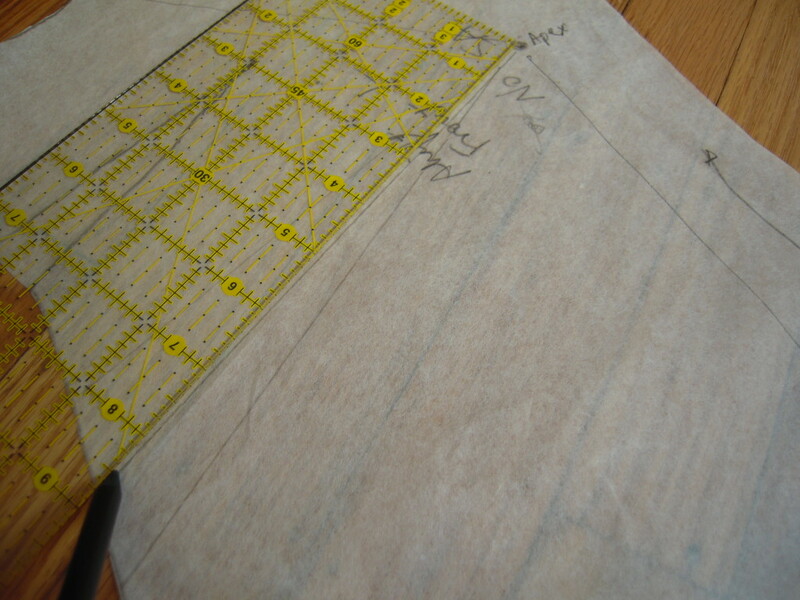 I added tracing paper to fill in the gaps and I now have FBA’d the pattern. Last but not least you need to make sure the bottom lines up. I didn’t bother cutting a piece and spreading it to match my new elongated front. I just added a bit of tissue paper to match. Sometimes it matters where you cut this last piece from. Sometimes it doesn’t. I just can’t forget to add a piece to the hem so that everything matches up. That’s really it. You might have noticed that I lowered the side dart. I don’t think I needed to do that, or move the apex down. When you do an FBA, your apex actually does get shifted a little lower. Practice. Practice. You’ll find what works for you and your body and then link your FBA tutorial below. I do the same FBA! It makes all the difference! 🙂 FBA Sister!!!! Yay! I love knowing I’m not alone. Thank you for your tutorial, because I have a slashed jacket pattern on my dining room table now with a 1 3/4″ FBA and trying it on, it’s not enough. Oh well, I had measured 3 times and chose the narrowest measurement because I thought over 2″ could be too big and the project was going off track. I usually sew knit tees and put in a 1″ + FBA since knits stretch so much. Thanks so much again, and Happy New Year! So glad you found me. I trust everything is going well now? There’s definitely a learning curve going back and forth between knits and wovens. Good luck! Any chance you can post the finished dress? I’m trying to decide if keRning how to make a FBA on some vintage shift patterns is my fitting solution. Does an FBA on a shift keep it from tenting over the bust? That’s what I’m after. Not sure if I should just pick a different style. I’m small framed with a d cup.